Nothing screams bold and fearless adventurer like an accessory crafted from rare materials. As its name suggests, the Dragonscale Quiver looks like it was pieced together from dragon scales, one of the rarest and most difficult things to come by. Of course, there is a reason for that, because to get dragon scales, you usually have to kill a dragon, and any common adventurer will tell you that killing a dragon is no easy feat. Luckily, the work is done for you when it comes to this quiver. It is impressively crafted from a double layer of top quality leather, with the top layer being stylized and layered to make it resemble dragon scales. The scales are fastened to a sturdier leather quiver base, which provides a solid and secure way to store your arrows, ensuring that you do not catch on leather dragon scales when you try to draw an arrow out. The quiver is rather attractive in its style, featuring domed metal studs along the rim, as well as heavy lacing on the bottom rim and the back, which serves to hold the quiver securely together. The quivers opening measures approximately 5 inches in diameter, while its body measures approximately 21 inches long. It is a perfect accessory to have when you are looking to store away arrows of any type, whether they are cushioned LARP arrows, blunted practice arrows, or sharpened traditional arrows! 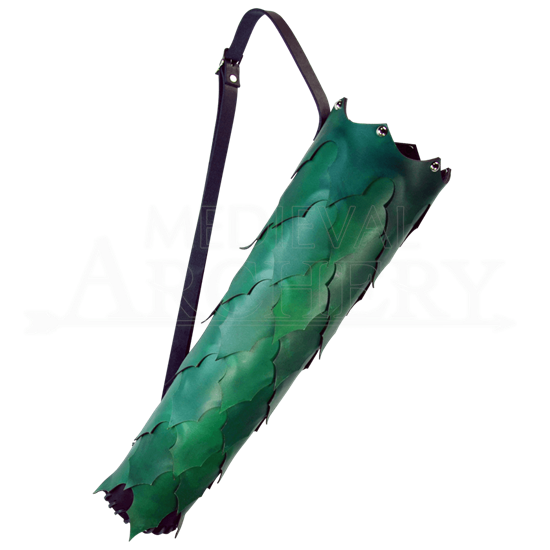 The quiver also features an adjustable shoulder strap that secures with a buckle, which allows this quiver to easily fit archers and bowmen of all shapes and sizes. This quiver is handcrafted right here in the USA and is made to our shop. There is no denying that this Dragonscale Quiver is a truly impressive thing, one that will add a touch of great fantasy style to your attire, while also giving you an effective place to store your arrows away, while keeping them just within reach, should you need to draw one.